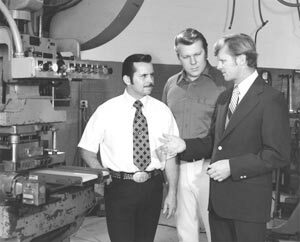 Dorner first opened its doors in 1966 as a tool and die shop. Two brothers Wolfgang and Horst Dorner, both tool and die makers founded the company. The company opened with a need for precision tool & dies and a focus on ‘catering to the customers’. Make a high quality precision product, make sure the customers are satisfied, provide responsive service, and the customers will reward us with their business. How right they were. This simple formula still drives every employee today. We like to call it the Dorner Difference. In the early 1970’s the Dorners were looking for a conveyor to efficiently remove scrap and parts from under their dies. Conveyors that fit under the die between the bolsters were not available. The profiles of most conveyors prevented them from fitting in the small pockets. Further people told the Dorners that a conveyor could not be built that small because a bearing that small would not be durable and belts would not wrap around small diameter rollers. The Dorners were determined. The result of this determination is that the Dorner’s developed and patented a new radial thrust bearing and worked with belting companies to obtain a flexible, durable belt. The Low Profile 4100 industrial conveyor was born in 1973. Within a few years the conveyor sales were greater than the tool and die business. The tool and die business was gradually phased out over a few years, but not the desire and the emphasis on precision for Dorner’s products and the focus on the customer. Since the 1970’s Dorner has expanded its line of conveyors from steel frames into a full line of Low Profile, Aluminum frame conveyors for every application. Dorner conveyors are used in over 1,200 different industry segments today. Dorner has developed a reputation for high quality products. When customers need a durable, reliable conveyor system they purchase a Dorner. Dorner conveyors are so durable, that original Dorner conveyors are still used every day and they are over 20 years old. Dorner has not only developed superior conveying products but we also have developed an application knowledge base for conveying. Dorner’s inside sales staff is trained and experienced in helping customers solve application challenges. Beyond the experienced inside sales staff, Dorner has CAE, customer application engineering. A team of engineers reserved to solving customer applications issues by modifying existing and building new conveyor platforms to meet special customer needs. At times there is nothing like seeing the customer’s applications to help create the right solution. Dorner has a trained field sales force that is supported by over 100 distributors that are based through North America and around the world, who can provide conveying solutions. Manufacturing of our conveyors is completed in a new 140,000 square foot manufacturing facility. In this facility we use lean manufacturing techniques to provide BTO (built to order) conveyors in days not weeks. Constantly evolving lean manufacturing processes have allowed Dorner to reduce costs and inventory. This has allowed Dorner to offer improved products to customers at lower prices. Dorner has also reduced lead-time for the customers. Every conveyor is built to the customer’s specific needs and requirements. Working from pre-engineered conveyor platforms, we are able to design, build and ship conveyors of any length and width in just a few days. Dorner is committed to the development of new and continuous improvement of existing conveying products. Dorner has a team of New Product Development Engineers, who examine market needs, and work with customers to develop new conveying platforms.